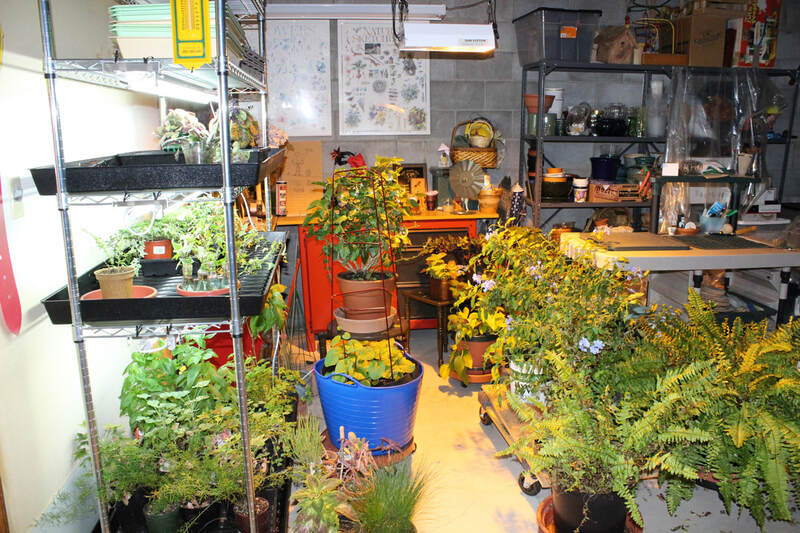 ​While few garden enthusiasts have the luxury of a heated greenhouse to access in the cold winter months, if a house has an unfinished storage area, then growing herbs, seedlings, cuttings, and even salad fixings is possible. Gardeners in the Omaha area are fortunate to have a business devoted to indoor gardening. On a recent trip to Paradigm Gardens Mark, my husband, mentioned to the owner, Ed Berna, that he was interested in replacing the 20-year-old wooden grow stand he had constructed to sustain my winter gardening activities. Over- waterings and unintentional run-ins (as in clipping the frame while turning a sharp corner) had left the three plant shelves bowed and the framework wobbly. 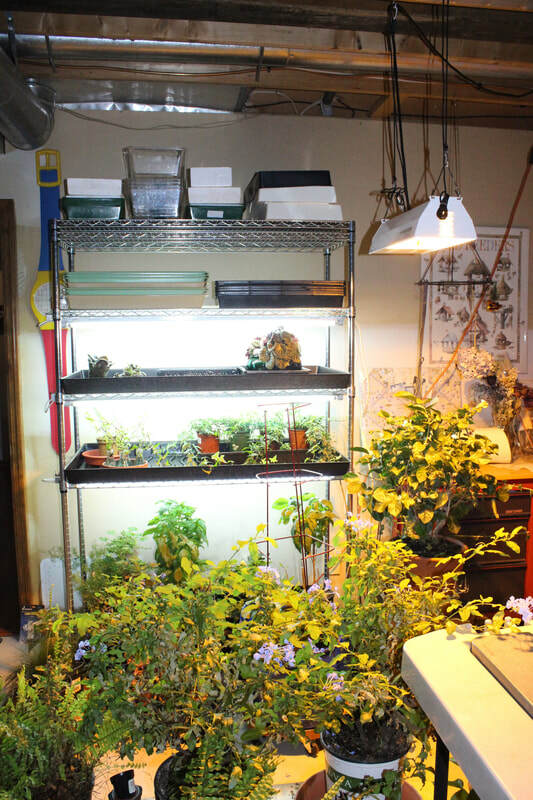 Berna ushered Mark into the back room where he was building a customer a three-tiered hydroponics setup. 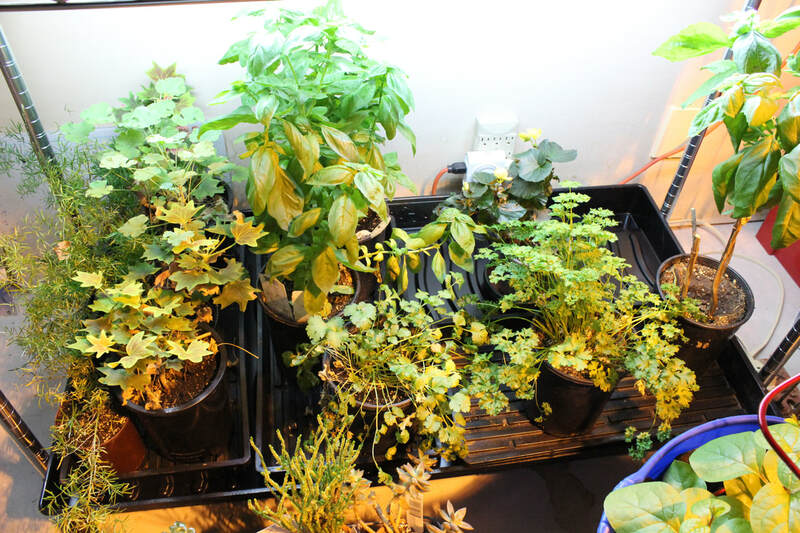 Since we were not interested in the hydroponics feature, Berna quickly explained how to construct this as a simple DIY project. The sturdy commercial-grade shelving unit on casters could be purchased at Sam’s for less than $90. The light fixtures currently in use on the wooden structure could be attached to the new metal unit with zip ties, available at any hardware store. Finally, Paradigm could then order three large trays, 24” X 45.5”, that would each hold four flats and eliminate watering mishaps. Mark was pretty excited by the possibilities when he came home. He took me along to check out the shelving unit at Sam’s. After we double-checked dimensions at home, the project got the green light. Now while we were at Sam’s, Mark asked me to look at a three-shelf commercial-grade cart, but I assured him that was unnecessary. What was I thinking! 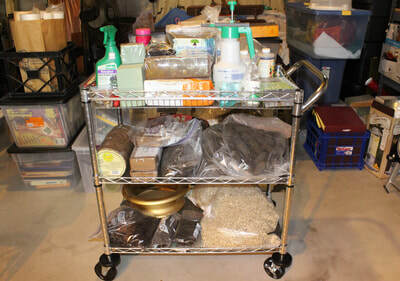 Of course, once I had the plants moved over to their new home and the potting bench, along with the surrounding area, cleaned up, I began to see how that cart could be a handy place to store indoor gardening supplies. It’s strange. Usually I am the one with the clear vision when it comes to matters of gardening. But Mark, glad to see order restored to the unfinished part of our basement, did not mind running over to purchase the cart. He put it together in short order. Believe me, I know how lucky I am to have a husband who not only accommodates but encourages my hobbies. Between the lighted plant stand and the Sun System lighting fixture hanging from the rafters, there are no short winter days at the Feldhausen home: the sun shines for twelve hours each day. Herbs are thriving. Blue tropical plumbago and yellow begonia slips are blooming. The delicate scent of jasmine fills the room. I picked Malabar spinach for a BLT—technically a BST—a few days ago. There are violet babies to pot up. And in mid-January it will be time to start lisianthus seeds. Life is good for a gardener who can carry on through all types of weather. For years I would look longingly at expensive, sophisticated plant set-ups in garden catalogs and think, “Some day.” It turns out everything I needed is actually available locally. And who doesn’t feel better being able to see exactly what is being purchased? Some expert advice and direction, along with the willingness to tackle a DIY project, made it all possible. However, since it is always a good idea to comparison shop, gardeners could also check in town for the utility cart at Costco and check for either entire indoor grow stands or lights and trays online at Gardeners Supply Company and Greenhouse Megastore. It is worth the trouble to end up with the growing area most suitable for each individual indoor gardener’s situation.